Showstopper! The Improvised Musical surfaced in 2008 as the result of a workshop exercise. The resulting one-hour extemporised musical sparked an improvisation phenomenon that has thrived at the Edinburgh Festival Fringe as well as in regular monthly sell-out shows in the West End. This new London residency, the first since its Olivier-winning 2015 run, will feature the creation of the 1000th musical developed through improvisation. The concept is fairly straightforward with host and producer Dylan Emery inviting audience members to suggest a setting for a new musical, followed by four different shows, the musical style of which will be incorporated into the piece. On press night, this resulted in Tennessee Waltz, a musical set in Nashville referencing the songs of My Fair Lady, Come From Away, Book of Mormon and Hamilton. 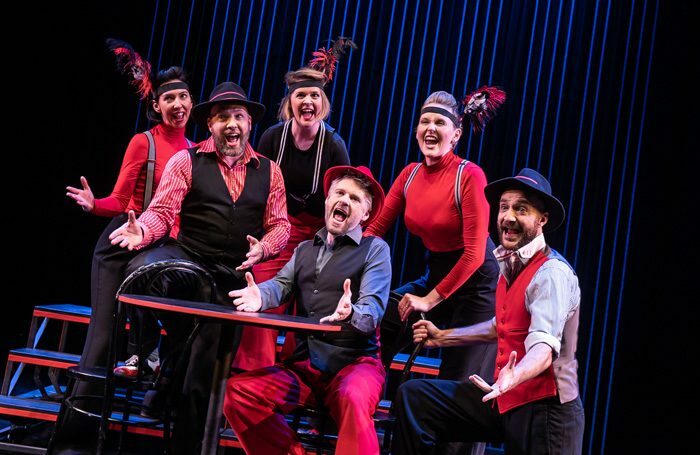 Emery stops the proceedings occasionally to steer the story but otherwise the performers and musicians, led by musical supervisor Duncan Walsh Atkins, deliver a hugely entertaining and wholly unpredictable new musical from scratch. The book, music and lyrics may not be hugely sophisticated but the choruses are catchy and the quick-thinking cast, who alternate throughout the run, deliver some surprising plot twists. Co-creator and director Adam Meggido makes an accomplished character actor and narrator but this particular evening belongs to Pippa Evans and Lauren Shearing as their characters hilariously change the course of LGBT+ politics in Tennessee forever.